Growing up, Leslie’s family told her she had a knack for finding the “good-hurt” spots and later encouraged her to enroll in the Massage Therapy Program and Lethbridge College. She graduated in 2010 and spent her two years there focusing on therapeutic, deep tissue techniques and also gained experience through her practicum placements at physiotherapy and athletic clinics. After graduating, Leslie operated a sole proprietor business for several years before joining East Meets West as Massage Director. 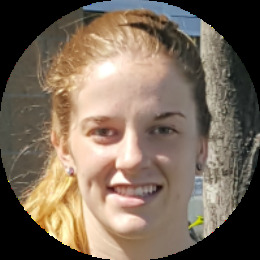 She enjoys being involved with many post-secondary schools in Southern Alberta to provide the opportunity for students to experience working as massage therapist in a clinical setting. As a therapist, Leslie believes there should be a balance between therapeutic techniques and a relaxing experience, and takes pride in watching her clients’ improve under her care. Focus areas: Chronic upper back and neck issues. Amanda was born and raised in Lethbridge, Alberta. She went on to complete the massage therapy diploma program at the Lethbridge college in 2014. She has worked in Calgary spas and clinics where she has been able to focus and hone her skills in therapeutic and spa styles. Amanda incorporates assisted stretching, myofascial work, deep tissue techniques as well as relaxation techniques in her massage. She is certified in hot stone massage and cupping massage and has recently completed her shockwave certificate, and is excited to be offering this new beneficial treatment to clients. She looks forward to adding more therapies to help her clients achieve their goals. Focus Areas: Neck, Back and feet. Breanne was born and raised in the Cardston area. She graduated from the massage therapy program at the Lethbridge College. She enjoys working on a number of different areas of concern. However, she prefers the back and shoulders. Outside of massage, Breanne loves to play with her dog, camping or curled up watching movies. Julie graduated from the Massage Therapy program at Lethbridge College in April 2013 and is a member of the RMTA. She has taken extra training for therapeutic approaches to treating the low back, legs and feet as well as in cupping and is sxcited to be able to offer this to her clients. She enjoys treating clients involved in motor vehicle accidents, and working with deep tissue and relaxation techniques. Outside of massage, Julie is a mother of two boys, and is an avid animal lover with her two dogs and cat. She spends many hours outside in her garden, and hopes to expand her knowledge in the gardening world. Focus Areas: Rotator cuff and frozen shoulder, plantar issues using cupping, and motor vehicle accidents. Keaton Craig completed the two year Massage Therapy Program at the Lethbridge College and is registered with Massage Therapy Association of Alberta (MTAA). Keaton played soccer for the Kodiaks during his time at the college, and has participated in many sports over the years which has furthered his desire to work with athletes to improve their overall health and wellness. Kelsey graduated from the massage therapy program at Lethbridge College. She enjoys working on a number of different conditions and areas of concern. However, she prefers to focus on the neck to relieve headaches and other discomfort. Her life goal is to win the lottery and live on an acreage with 20 dogs. If that doesn't work out, she plans to pursue a career in physical therapy. Focus areas: Neck, and headaches. Kenzie graduated with honors in 2013 from the Southern Alberta Institute of Massage (SAIM) in the Advanced Massage Therapy program. She has been a member of the Natural Health Practitioners of Canada since 2013 and has been a part of the East Meets West family since March of 2014. She enjoys doing deep pressure massages, but will accommodate any preference of pressure. Working with other health practitioners at East Meets West has given her the opportunity to work with a variety of conditions and degrees of injuries. Focus areas: Back and neck, and full body massages. Since she was small, Kitana always loved giving her mom back massages, so after high school she enrolled in the Lethbridge College Massage Therapy program. She loved learning how to heal people through massage. After grauating in 2016, she joined the East Meets West team. Kitana enjoys performing deep tissue massage and taking care of peoples hurts. In her spare time Kitana enjoys reading books and spending time with her family. Focus areas: Headache, back problems, and deep tissue work. Nicole graduated with honours from Lethbridge College in 2010 and has since taken additional training in energy work such as Reiki and Craniosacral Therapy which she incorporates into many of her treatments. She enjoys seeing progress in people and watching them increase their range of motion or relieve headaches and other stress related conditions. When she’s not working, Nicole likes camping throughout the summer, spending time with her two Dobermans, and reading. Focus areas: Runners including legs and glutes, headaches with focus on the neck, shoulders, face, and scalp. Massage has been a huge part of Sarah’s life from a very young age with people telling her that she has the healing touch as long as she can remember. She graduated from the Massage Therapy program at Lethbridge College in 2003. In 2006 she became a member of the NHPC and operated her own mobile massage business for roughly 13 years. She has continually expanded her repertoire by undertaking training in numerous soft-tissue therapies such as Rain Drop Therapy with essential oils, Stamina and Alignment Orthopedic Massage, and most recently Hot Stone Deep Therapeutic, and Spa. She specializes in Stamina and Alignment Orthopedic Massage and enjoys the challenges that clients bring day after day and the rewards of seeing them improve with her treatment. Sarah joined East Meets West in September 2015. Focus areas: Sports injuries, knees, sciatica, lymphatic drainage, and super deep tissue.